Congratulations to Rwanda on becoming the next country to celebrate the Commonwealth Heads of Government Meeting in Kigali, 2020! Kigali is a fast-paced and vibrant international city, which many visitors use as a base for exploring Rwanda. Tourism is thriving in the city which is located along picturesque hilltops and is renowned for its hospitality and cleanliness. There are many institutions like the United Nations (UN) and World Bank, which brings visitors from around the world to work on programmes with the Rwandan Government and African Union, giving the city a cosmopolitan feel. Tourism is booming in Rwanda and has now overtaken coffee as the country’s top foreign exchange earner. Visitor numbers are continuing to increase year on year with tourism grossing $400 million in 2016. The draw to Rwanda looks set to continue attracting more visitors this year as people look forward to the next CHOGM 2020 event. 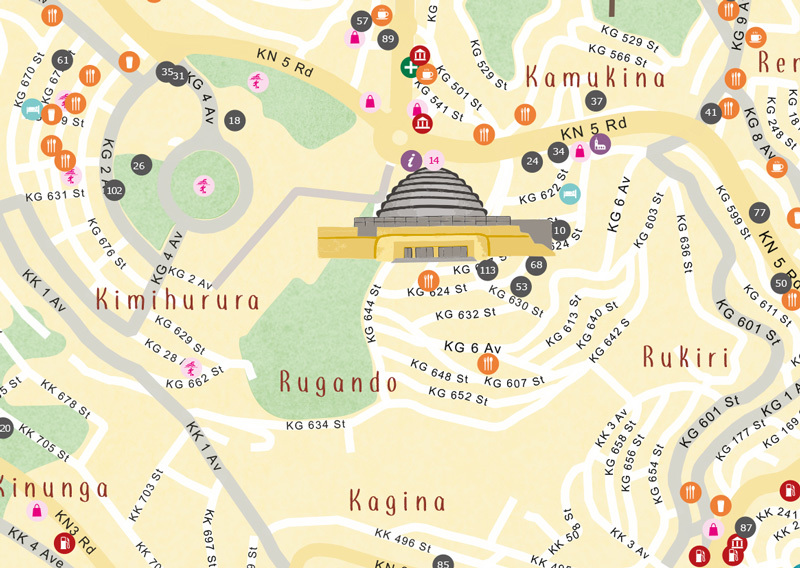 We developed the map of Kigali with a local hotel and tour guide, we wanted to make sure we showed the most relevant information for visitors, to assist them to get around when in the city. There are more than 70 governmental and non-governmental offices listed on the map, as well as 12 university campuses and 39 international embassies and non-governmental organisations, ensuring visitors can find their place of work. We covered not only the essential cultural and religious aspects of Kigali, but the fun things to do too. Did you know that you can go for a swim at Hotel des Mille Collines? Or if you’re looking for good food and wine check out the Kimihurua District. Looking for more of a cultural experience? Then try the Inema Contemporary Art Centre showcasing fashion; handcraft production and cooperative centres where you can watch traditional weaving and beading. With Kigali being right in the heart of the country it’s the ideal location to explore what Rwanda has to offer. Rwanda is warmly known as the land of a thousand hills and offers visitors an unforgettable experience. Rwanda has stunning national parks, spectacular volcanoes and is home to the largest number of endangered mountain gorillas. Volcanoes National Park is home to the mountain gorillas and golden monkeys. 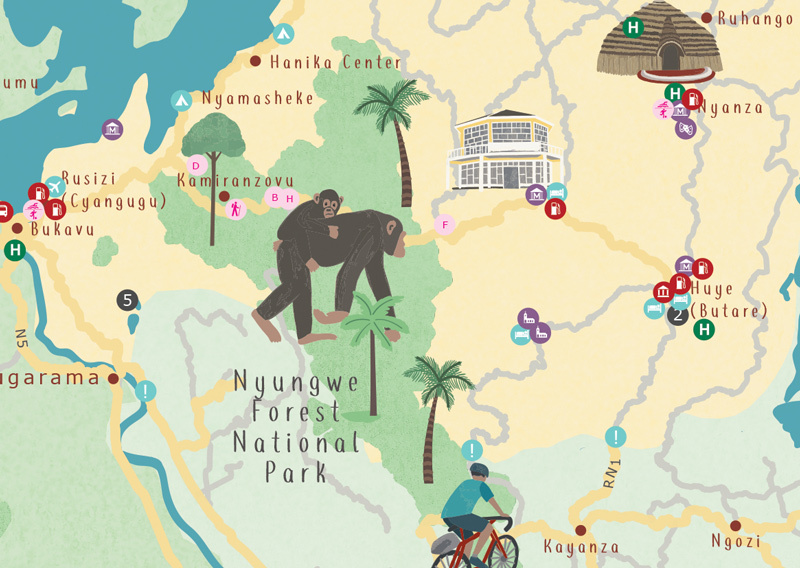 In the south west, Nyungwe Forest National Park offers ancient rainforests, the perfect habitat for chimpanzees and other primates, cycle trails are also available for the adventurer looking to pedal their way around. Lake Kivu (West) and Lake Lehma (East) provide glorious places to rest and unwind after bird or hippo watching. 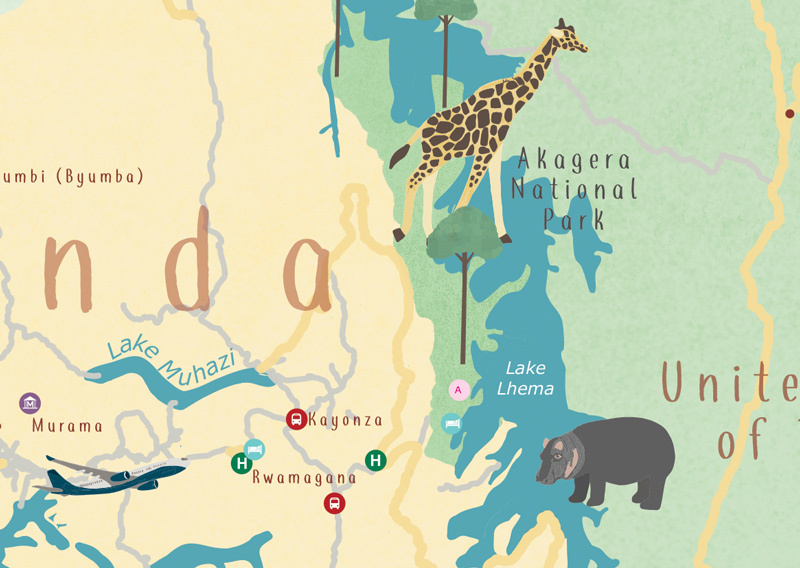 The Rwanda map shows the diverse landscape available to visitors with beautifully illustrated animals that visitors will see during their visit. 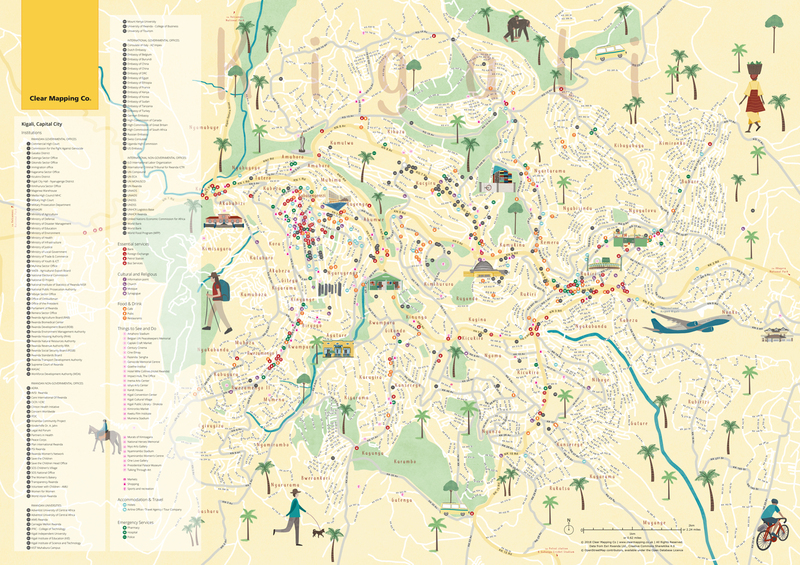 The reverse side of the map shows Kigali city in a clear user-friendly design enabling visitors to easily navigate their way around the city and find all the essential attractions. Both maps have beautiful hand-painted details, which bring the maps to life. 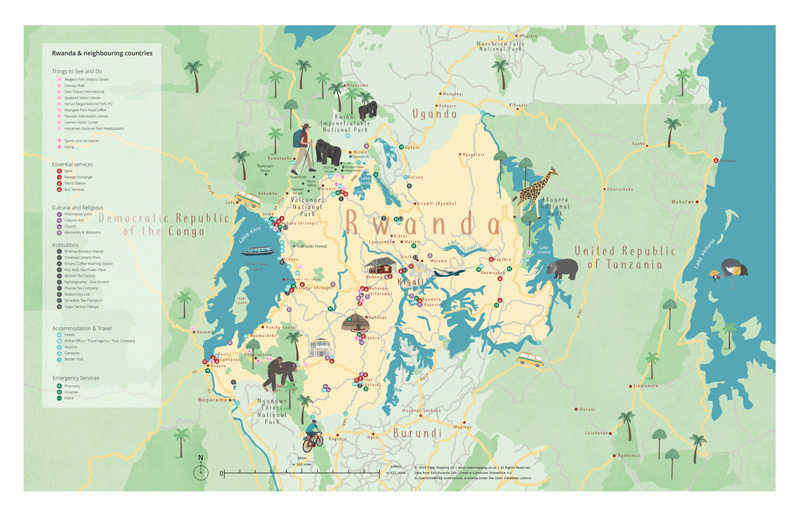 The maps are an essential up-to-date guide for visitors on arrival to Rwanda, they can also be used to welcome guests as a poster near the reception. This was the first time we have ever done anything like this and we are delighted with the result! I would happily recommend Caroline and the Clear Mapping Company to others!